Vancouver Island and nearby smaller Gulf Islands offer some of the best and most varied bike trails in the world, and mountain biking can be indulged in year-round here. The region is known for its technical rain forest singletrack, characterized by big trees, logs, roots, rocks, and other interesting obstacles, not to mention the variety of stunning scenery, and plant and wildlife. The Comox Valley boasts some of the best and most plentiful biking trails on Vancouver Island, indeed, in British Columbia with enough variety to suit any rider. The range of terrain in the Comox Valley truly is from mountaintop to ocean-side and varies from steep and gnarly to smooth and easy. Here are just a few suggestions. Drive to Mount Washington Alpine Resort, about 20 minutes from the exit off the new Inland Island Highway 19, where you can take your bike on the chair lift to the top during the summer season and ride the Monster Mile Downhill. Mount Washington has expert to intermediate terrain. In the Valley bottom, there are several places that accommodate bikes amid the nature trails in the Comox Valley's Regional and Provincial Park system. Find the riverside trail systems near Nymph Falls for a technical ride along the Puntledge River. In Comox, the Northeast Woods, accessed from Pritchard and Guthrie Roads, offers moderate terrain not far from pubs and restaurants. In Seal Bay Park, located to the north of Comox and Courtenay, bike riding is permitted on the landward side of Bates Road. When you've finished exploring there, park your bike and walk down the footpaths to the beach at Seal Bay where you can see across the Strait of Georgia to Powell River and the Sunshine Coast. If cycle touring is more your style you will find many roads suitable for cycling that connect regional parks and small communities throughout the Comox Valley. 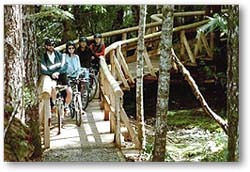 A cycle tour of Denman and Hornby Islands is a unique way to experience our Northern Gulf Islands. Take the ferry from Buckley Bay to Denman Island and catch a connecting ferry to Hornby Island where there are options for cycle touring and mountain biking. Schedule a stop at one of the tempting bakeries on these islands or plan to tour during the various special events that occur throughout the summer season. 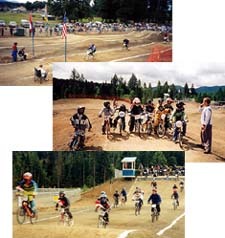 BMX fans: visit the new state of the art BMX race track located in Cumberland on Dunsmuir Avenue next to the Village Park. The track is open daily to the public except during official races.